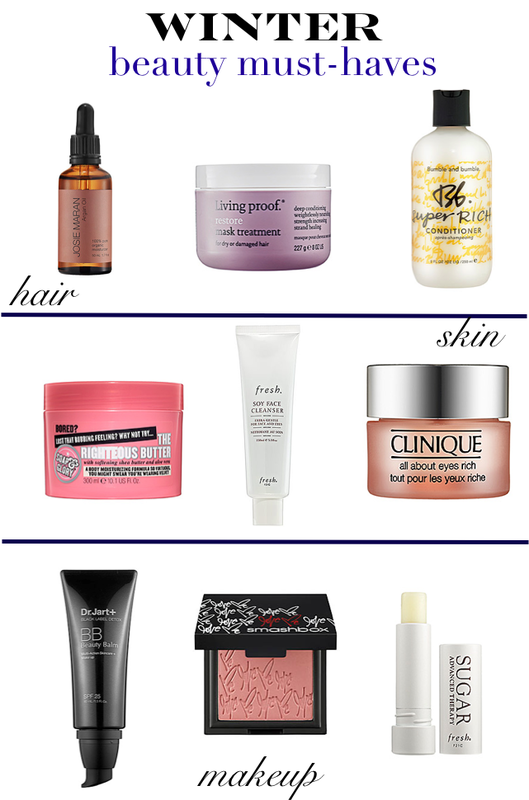 I love Winter- skiing, the snow, snow days- but the season can seriously damage your hair, and skin. Hair becomes unruly and dry, and your skin is stripped of moisture. I really amp up my routines during the colder months, it truly makes a difference. I swear by the products I've included below. What are you favorite Winter must-haves? Also, be sure to check out my favorite Resort picks to see what I'll be wearing when I escape the cold. Living Proof Restore Mask Treatment- When used once a week, it adds moisture and treats damaged locks. Bumble and bumble Super Rich Conditioner- My go-to conditioner. It keeps your hair silky and smooth. Soap & Glory The Righteous Body Butter- Smells like heaven and your skin is soft after one use. Fresh Soy Face Cleanser- Great for sensitive skin. Clinique All About Eyes Cream- The best eye cream ever. Dr. Jart+ Black Label Detox BB Beauty Balm- I use it everyday. Very light, but still gives your skin a healthy glow. Smashbox Love Me Blush - I also use this blush everyday. The perfect amount of pink to your cheeks. Fresh Sugar Advanced Therapy Lip Treatment - Keeps your lips moisturized. Apply tons at night, to wake up with smooth lips.